Visitors to the south-west of France will no doubt have had the opportunity to try the signature dish of the region - Cassoulet. A glorious stew of beans infused with a cornucopia of meaty goodness (vegetarians may as well stop reading now, sorry!) that is the perfect dish for the winter months - prepare the night before, stick it in the oven after breakfast and it will be ready to warm you up after a bracing winter's country walk! 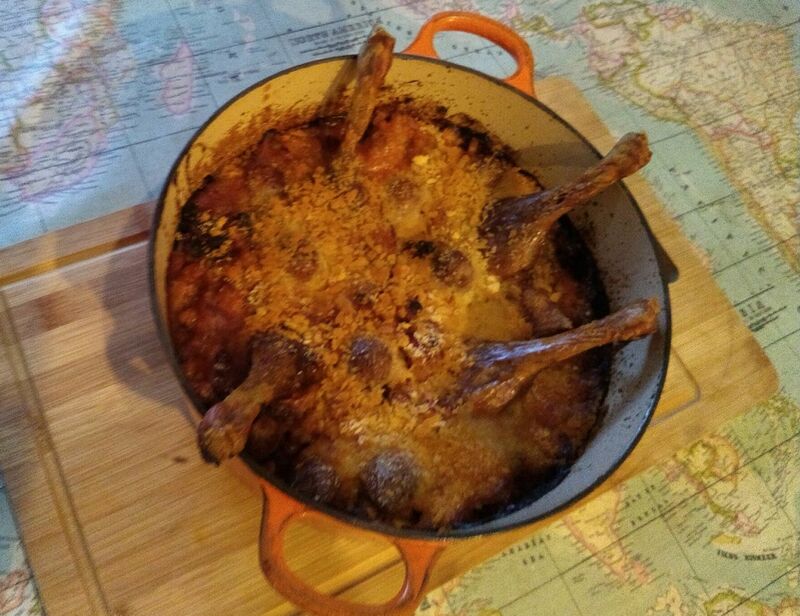 There are various versions of Cassoulet - the 'right' way is hotly disputed between the towns of Carcassonne, Castelnaudary and Toulouse - but even within those towns there are different ways of making and 'essential' ingredients. The Carcassonne version described here majors on toulouse sausage and confit duck, but others feature ham hock, goose and lamb! To cut the meats, roll up the pork rind like a Swiss roll. With the seam underneath, use a very sharp knife to cut the roll across into thin slices, then chop the rolled-up slices across into dice. Chop the bacon into small cubes Toulouse sausages can be left whole, bit if you are using a latge gatlic sausage, cut into 1 inch chunks. Drain the soaked beans and discard the soaking water. Tip the beans into a large saucepan, add the diced pork rind and lardons and cover with fresh cold water. Bring to the boil and blanch for 15-20 minutes. Drain the beans, rind and lardons into a colander, and discard the cooking water. Heat the goose fat or olive oil in a 26cm flameproof casserole or deep overproof sauté pan over a low heat and sweat the celery, onion, carrot and garlic for 5 minutes. Add the tomatoes and bouquet garni and cook slowly to get a sugary caramelisation (about 5 minutes). Add the sausage, beans, pork rind and lardons and pour in 1.2 litres/2 pints water. Bring to the boil, skim off the scum, then add the salt, pepper, clove and lemon juice. ransfer the casserole to the oven and cook, uncovered, for 2 hours, stirring every hour. At the end of this time, the beans will be soft and creamy in texture and the juices should have thickened. You may need to cook it for longer than 2 hours (say up to 2½ hours) to get to this stage – it depends on the beans. Remove the cassoulet from the oven. Bury the duck legs in the beans and sprinkle over the goose fat or olive oil, breadcrumbs and garlic. Return to the oven and cook for a further 2 hours. Serve the cassoulet in bowls, sprinkled with chopped parsley.